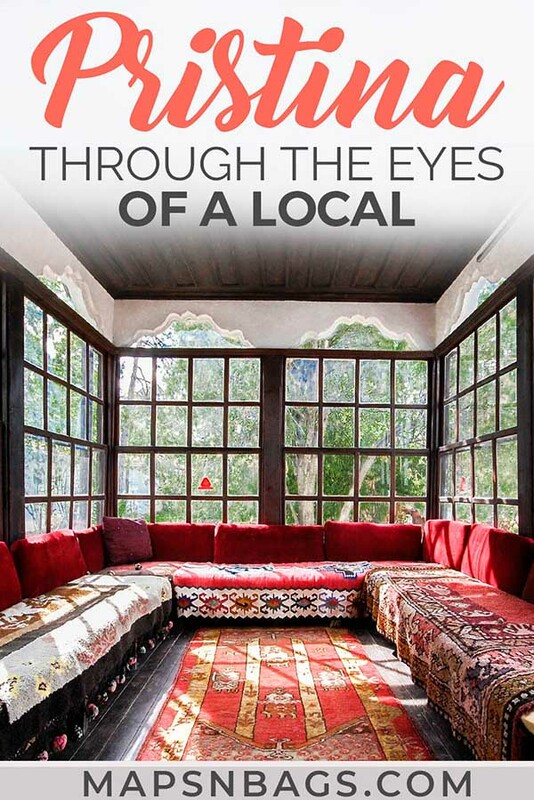 Here we are again with another edition of the interview series “Through the Eyes of a Local”! I’m pleased to say that in today’s interview we’re going to get an insider’s view over Pristina. Pristina or as locals call it Prishtina is the capital of Kosovo, a new European country that only declared its independence in 2008. It has a population of 204,725 (2015 estimate). The government institutions are centered in Pristina as it is the case with almost every other international organization. 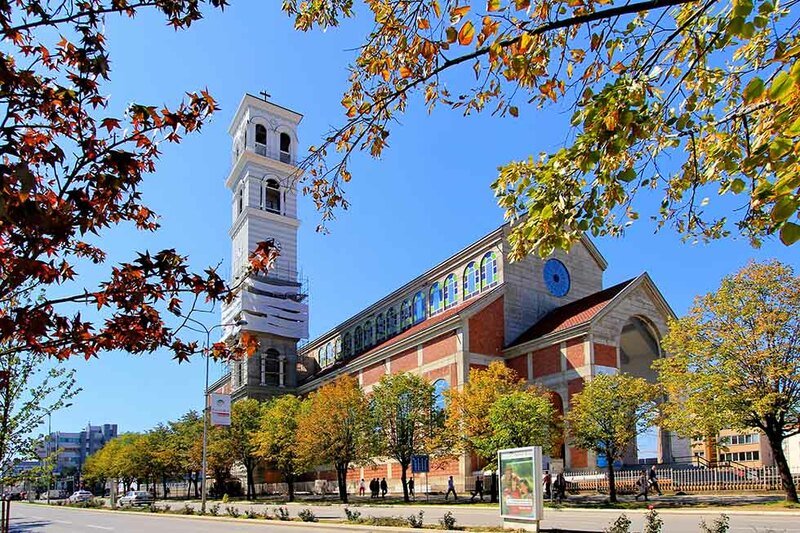 Pristina offers several interesting attractions, three main and several small parks, a warm, welcoming atmosphere for visitors, a great coffee culture, and lots of food options. The capital has a perfect location favoring visiting the other cities in Kosovo or even going around in the region (Tirana being only 4 hours away, Skopje 2 hours, Belgrade 6 hours, and Podgorica 5 hours). Curious about other cities around the globe? Then check our archives for many interviews of the “Through the Eyes of a Local” series. I am Lavdi, and I come originally from Gjilan, a city in East of Kosovo, but I’ve moved to Pristina initially for my studies at university back in 2006 and then started working and building my life here. Currently, I work as a freelance consultant/researcher with an NGO and also own the travel blog Kosovo Girl Travels where I talk about my travels, write about Kosovo and my struggles to travel due to Kosovo’s political situation and the visa regimes. Regarding my hobbies, I love traveling, photography, reading, and writing. Also, I enjoy walking around cities and finding hidden treasures and non-touristy places anywhere I go (including my hometown). What do you like about Pristina? Pristina is a small city compared to other European capital cities, and maybe that’s what I like a lot about it. It is pretty walkable, and in a few minutes, you can go from one neighborhood to another to meet friends or just enjoy a drink. Pristina is very friendly to people, both locals and tourists, and anyone can find something to enjoy according to their taste. Which three places in Pristina do you highly recommend paying a visit? Start your visit with the Saint Mother Teresa Cathedral located pretty much centrally and climb to the top of its observation tower to have a view of the whole city. 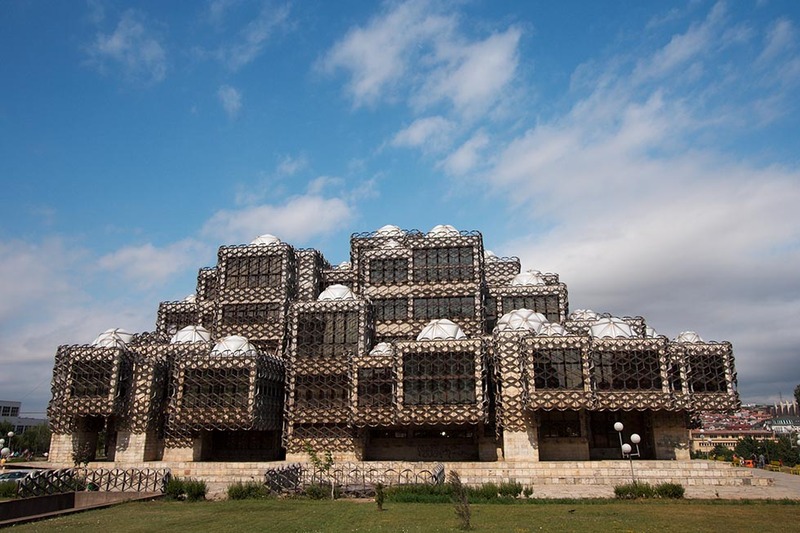 Continue to the National Library which, I believe, unjustly has been put among the ugliest buildings (see photo below), but go inside and see its beautiful paintings by yourself. 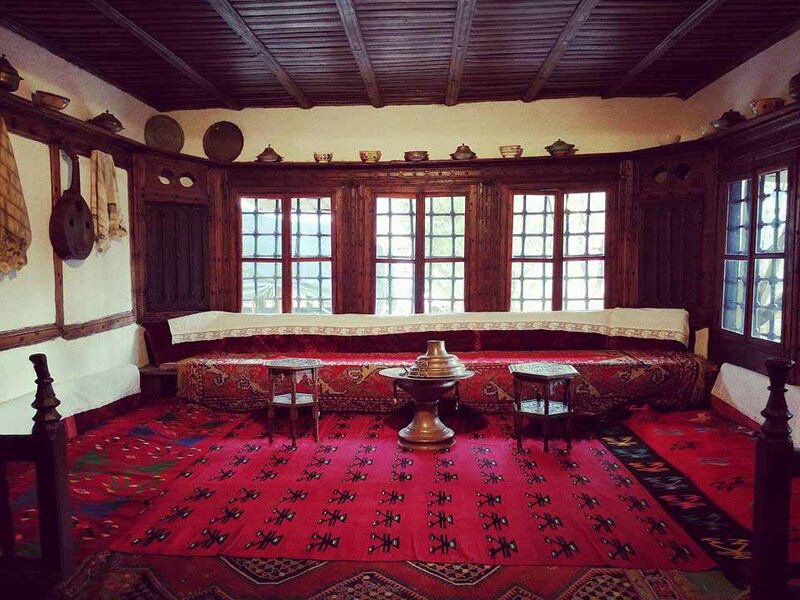 The third place I highly recommend visiting is the Ethnographic Museum – this is a place that showcases a time in our history, the traditional clothes and way of living which would give an insight (to locals alike) what life used to be. There aren’t places to avoid due to safety concerns, but there are parts of the city where there is no attraction to be visited so no need to go there for just being at a residential area. Stay around the center of the town, go to Rruga B for restaurants and street art, or go around Qafa for small cafes. What is the best way to get around Pristina? Is it easy to reach nearby cities? Getting around the city can be done quickly on foot. However, there is public transport and taxi service. Biking in the city center is smooth but not so much for commuting to the periphery or some neighborhoods due to its hilly structure. Reaching nearby cities can be quickly done by public buses (running from the bus station or some even going through Pristina – like the one going to Fushë Kosova, Obiliq, or Podujeva). Pristina is very travel-friendly. Everyone will do their best to help out foreigners to get what they want. Most of the people speak another language in addition to their mother tongue (Albanian). Older people usually will be able to speak in Serbian, while younger generations will be able to help tourists out in English, German, and also might have limited knowledge of other languages such as Spanish, Italian, or Turkish. 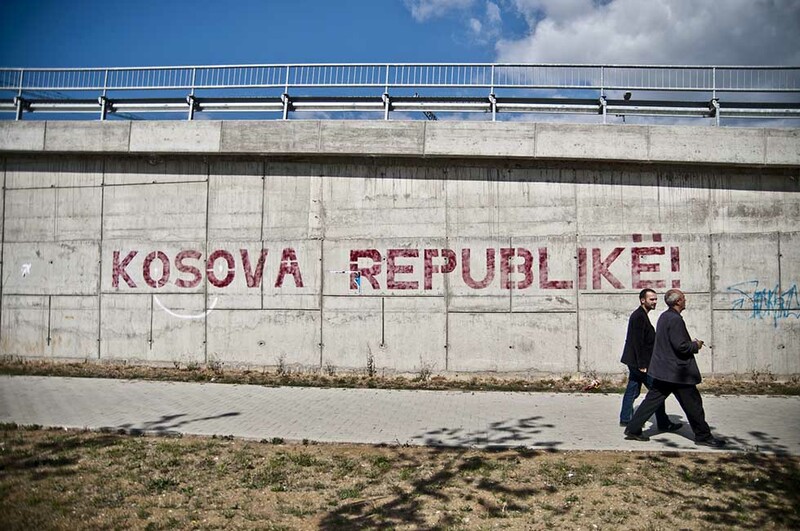 Pristina, and Kosovo, in general, is considered to be very safe. You can walk freely with your camera and take pictures here and there, and also walking at night is safe. Of course, it’s always recommended to be cautious of the surroundings, and there will be catcalling, but I haven’t heard of anyone getting into trouble while visiting Pristina. What is a unique aspect of your culture? The coffee culture in Pristina is excellent. You will see people all the time sipping their macchiato and hanging out with friends or family. The main boulevard (Mother Teresa) is always full of people wandering around and enjoying their time and also the ice-cream or popcorn sold by local salespeople. The observation tower at the Saint Mother Teresa gives the best view of the city. It is 360 degrees view that is also good to start your visit with. What is the most traditional dish of Pristina? The traditional Albanian dish is considered to be Flia. It is a multiple crepe-like layers food brushed in between with cream. It takes about 2-3 hours to be ready and usually it is served with cheese, sour cream, yogurt, ajvar, or even honey. Could you recommend a local bar and a restaurant? There are a bunch of good places to eat in Pristina, and each bar has a special atmosphere, and I pick them depending on how I feel at that moment. A place I love to go time after time is Monròe café and bar, located by what locals call Kafet e vogla (small cafes). It has a lovely environment, excellent service, tasty food, and cocktails. What is the biggest tourist trap of Pristina? Tourists think it’s enough to spend one day in Pristina and that would be the most prominent tourist trap. To understand the city one should stay at least one night to experience its coffee culture, nightlife, and the vibe Pristina gives to people. On the other hand, as everywhere else the taxi drivers will try to make their trip longer, so it costs more so just be careful of that – know where you’re going and use the shortest way. I used to come to Pristina even before moving here for my studies to visit my relatives and what at that time seemed a long distance from their house to the (new) square “Adem Jashari” now seems a short walk. I used to go there with my cousins and play by the “Vllaznim Bashkimi” (Brotherhood and Unity) statue and at that time (I’m speaking for like 20 years ago – my God I’m getting old haha) that was considered quality time. Now, one of the cousins I used to hang out there has passed away and every time I pass by that area reminds me of him and all the fun times we spent together when we were little. Could you describe the people of Pristina? The majority of Pristina citizens are Albanians and very welcome (in particular towards internationals). They are open, very curious (don’t be surprised if you’re offered a coffee or something from random people), committed to helping tourists out (if they don’t know the answer will find someone who does). Being the capital city also means that people are busier than in the other towns in Kosovo; however, after working hours they’re all ready for a drink in one of the many cafes around the city. Tell us a fun fact of Pristina. Pristina doesn’t have a river although it used to have one. Also, Pristina is known for having unstable weather with, sometimes, summer, spring, and fall happening within one day. Therefore, even if one visits during the summer season, they should always bring long sleeves clothes item with them for the night time. Plan at least one night in Pristina. It might seem a small city with not much to do; however, you will find that the most important thing here is also to take your time, enjoy the culture, and meet the people. Don’t rush to leave the city and miss out this experience that you will have it hard to find elsewhere. Is overtourism a problem in your city? If so, could you explain why and how? Overtourism is not a problem yet in Pristina, and considering tourists mainly use it as a transit city between Skopje and Prizren usually, it won’t be a problem. Kosovo has many expats who come home during summer, and this causes traffic congestion, but that doesn’t qualify as tourism as those people kind of belongs here, too. 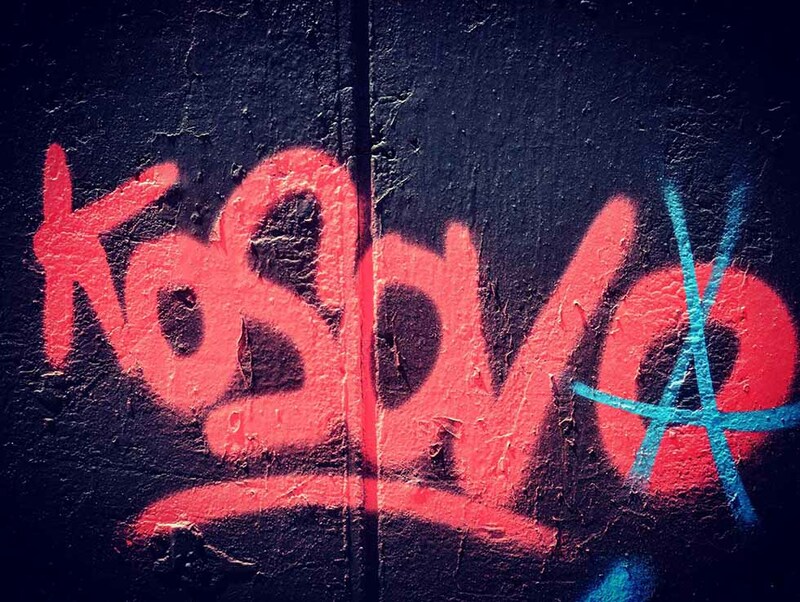 What is the biggest misconception other countries have about Kosovo? Most of the tourists I’ve met have expressed their surprise of not having found the Pristina they were thinking. When I asked them what they were expecting they said they thought it would still be war-torn like (it’s been almost 20 years since the end of the war), and not as modern as it is. Being propagated as a Muslim country (while we’re secular in our constitution and mostly Nominal Muslim), tourists expect to see covered women in hijabi, no alcohol around, and many mosques around. When they come and see modern cafes, restaurants, and women and generally people dressed as in any other European country it surprises them. Also, I’ve heard some neighbors of Kosovo had told some visitors that people here don’t speak English which is untrue and we were laughing with those people who said it to me as that’s really a very low game to play against your neighbor. Can you tell us a book based on Kosovo? Kosovo: A Short History, a book by Noel Malcolm is a great book to read before coming to Kosovo. It gives you a short history so much needed to understand not only Kosovo but also the whole Balkans. Although it doesn’t cover the events after 1997, meaning the last war, it is still very resourceful and an essential read. 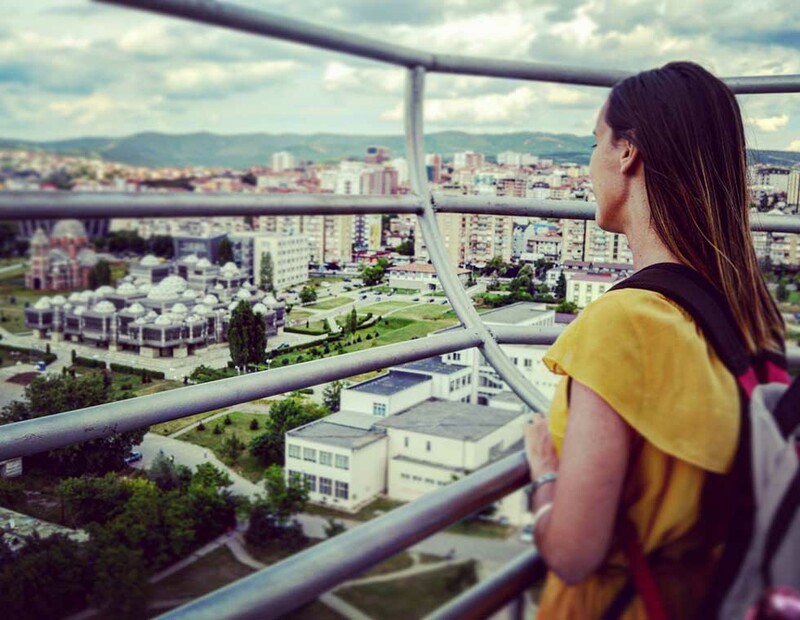 I am a Kosovo girl who has a passion for traveling. I’m currently working as a freelance consultant/researcher. It’s hard to travel from Kosovo due to several factors: non-recognition of my passport, non-recognition of my country, expensive flights, lack of money, lack of time, etc. However, I’m doing my best and using every opportunity I can to visit as many countries as I possibly can. Being from Kosovo limits me as I can travel to only 44 countries visa-free/visa on arrival (this changes depending on the political developments). Until now, I have visited 31 countries. I am moving soon to South Sudan to work with UN Volunteers. Follow my blog, Kosovo Girl Travels, to understand how is life there. Follow Lavdi on Instagram, Twitter, and Facebook. Did you like this article? Then share it on Pinterest! This entry was posted in Europe and tagged Interview, Through the Eyes of a Local.